We say that a polynomial ideal I is set-theoretically generated by a family of elements f1, …, fk in I if the radical of I coincides with the radical of the ideal generated by f1, …, fk. Over an algebraically closed field, the smallest number among all such possible k is the minimal number of equations needed to define the zero set of I. To find this number is a classical problem in both Commutative Algebra and Algebraic Geometry. This problem is even not solved for the defining ideals of toric varieties, whose zeros are given parametrically by monomials. In this lecture notes we study set-theoretically generation of the defining ideals of simplicial toric varieties, which are defined by the property that the exponents of the parametrizing monomials span a simplicial complex. We review and improve most of results on simplicial toric varieties which are set-theoretic complete intersections, previously obtained by the author in collaboration with M. Barile and A. Thoma. 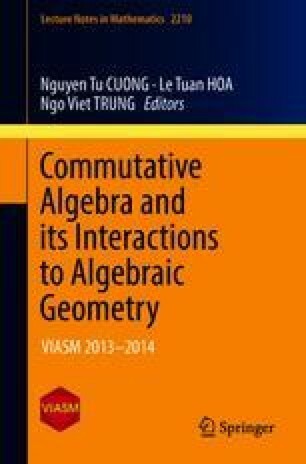 The author thanks Vietnam Institute for Advanced Study in Mathematics (VIASM) and the Institute of Mathematics of Hanoi for their support and hospitality. Sincere thanks are due to Le Tuan Hoa, Ngo Viet Trung, Mesut Sahin and the anonymous referees for many useful suggestions which has improved the presentation of the lecture notes.